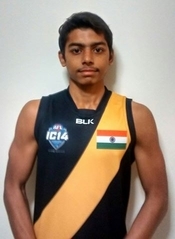 At just 20 years of age, Mayur Paymar is a virtual “veteran” of Indian Australian Rules football. He has been part of the football scene in Mumbai, as part of the ever growing AFL Maharashtra league from a very early stage. His account, and his journey to the fields if the IC14, is a fascinating story of a new country to the game embracing it. As a final word, Mayur considered the health of the game in India at the moment. “The passion for the game has been very much improved over last couple of months. Now we have 100 kids that are playing every weekend, even with the monsoon other every single day. Mayur’s journey and story is a great account of one person’s growth with a game in the world’s second most populous country. We hope that growth continues and the team enjoys and grows from the rest of the International Cup experience.